An important part of Kirby-Smith’s ministry is serving smaller communities of faith. 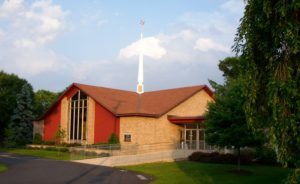 The consistory of the Petersburg Reformed Church began in 1848 and in one form or another has been serving the community of East Petersburg, Pennsylvania for 170 years. Today, Trinity UCC is a strong but smaller community of faith offering a wide variety of ministries including a pre-school. A $1 million plus construction project seemed impossible for the members of Trinity UCC…but they exceeded their goal!